Steve Chong reunites his three estranged friends for one final weekend at a remote lake house. When the guys discover that Steve plans to kill himself, they scramble to keep him alive amidst the drunken chaos in this dark comedy of failure and friendship. The weird humor makes the film work, but it is the genuine camaraderie between the four friends that anchors it. Real people, real problems - that's all I ever wanted from a movie. 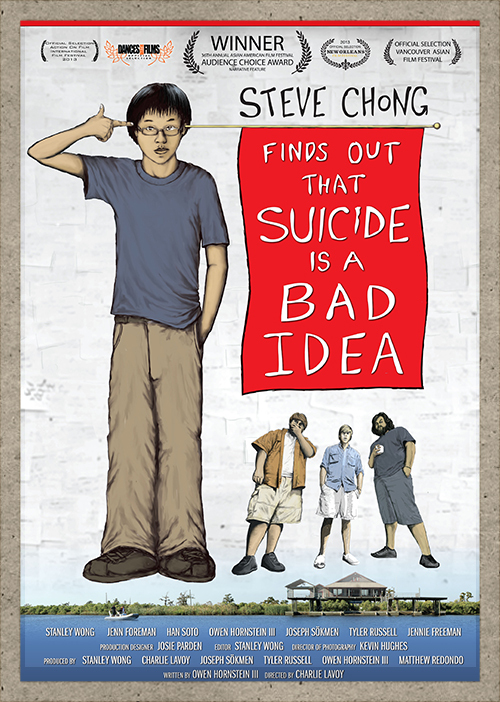 Steve Chong Finds Out That Suicide Is A Bad Idea is now available across American Cable in Movies on Demand! ​Steve Chong is a failure. Every time he screws up he writes it down on a note card and pins it up on his wall. It’s not long before his failures run floor to ceiling. The final card is placed when he gets fired by his own cousin and ruins his best and last chance with his dream girl from work by turning down her offer to cheer him up with a wild weekend out at a remote lake house. As he covers the last bare patch on his entire wall of failure, he realizes that his life is over and it is time to die. But first, he calls up his three estranged friends and invites them out to his family’s lake house for one final weekend of relaxation and intoxication. John is wrestling with the idea that he’ll have to shave off his infamous beard in order to get a job, Tom is busy juggling all the women in his life, and Chris is struggling to get over the girl that Tom stole away from him long ago. Despite their differences, the four friends head out to the lake-house and go on a drinking rampage. Deep into the night, the guys mistakenly stumble across Steve’s dark secrets and scramble to keep him alive through the drunken chaos of the weekend without revealing that they know about his death wish. When the girls that Steve turned down earlier show up, chaos breaks loose and no one can predict exactly what Steve has planned.